With Christmas coming up soon, I’m starting to craft a gift giving plan. I like to make my own gifts as much as I can, partly because it’s a very expensive time of year and partly because it seems more meaningful when I give something not store bought or factory produced. Of course, this idea can backfire. Two years ago I decided I wanted to make quilts for my family. I’ve never sewn anything more than a straight line to make curtains, but for some reason I got it into my head that making not one, but TWO quilts, all in time for Christmas, was a good idea. And ultimately it *was* a good idea – my mom & my sister both love the quilts I sent them & they’re used regularly. The bad idea came in when I was up until 3 a.m. finishing the quilts so I could pop them in the mail by the post office deadline. What started as a gift made with love turned into a gift that was literally keeping me up at night. I’m sure I’ve mentioned before my love of This American Life. I listen to the podcast while I’m painting and have downloaded several mp3s to take on long road trips. The stories are always interesting and the host (my secret boyfriend) is Ira Glass, the nerd girl’s Brad Pitt. My real life boyfriend took me to see the live re-broadcast in a movie theatre a while back & it was so great to put a face to the dreamy voice I’d been swooning over for years. And now? I can put a finger to it too! 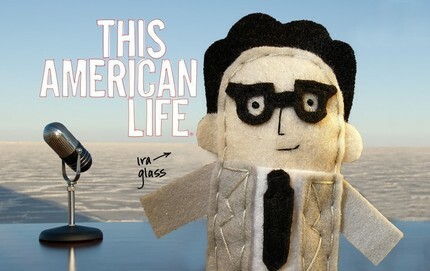 The Ira Glass finger puppet by Abbey Christine is just one of her cute creations. Equally awesome – Lloyd Dobler, Johnny Cash & Bob Ross. So cute!